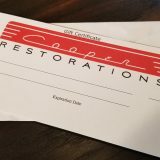 Gift Certificates are available for any amount starting from $20 on up. If ordering online, specify amount desired, and we will invoice it accordingly. Good for one year from date of purchase.